There are a few things we need to consider when confronted with a downhill lie. Even when struck perfectly, shots from these lies will tend to come out lower and run out more than shots from a flat or uphill lie. 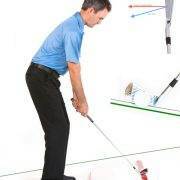 The ball may also have a small tendency to go to the right, simply because our body weight is more likely to shift ahead of the ball producing, a block or a fade. Knowing that shots go lower and longer from a downhill situation, we’ll need to choose our club accordingly. Sometimes it’s appropriate to take a more lofted club, but this will depend on the severity of the slope and the situation you are in. Practice and experience will certainly help you make these kinds of strategic decisions. When we set up to the ball, it’s important to remember that whenever we strike an iron, we always want to make contact with the ball prior to making contact with the turf. 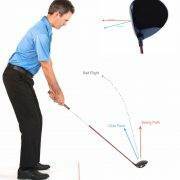 I suggest positioning the ball an inch or two back from where you normally would with the club you’re using. When you set up to the ball, try to, as I say, ignore gravity. Think of your spine setting up perpendicular to the ground, and a line drawn across your shoulders being about parallel to the ground, just as you would in a flat lie. Unless it’s an extreme circumstance, your set up position in a downhill situation should be the same as a flat lie, just leaning to the left a little bit. 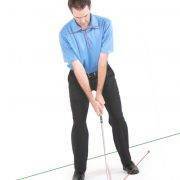 You’ll feel more weight on your left leg in the set up position. The problem that many players come across in this situation is when they begin leaning up the hill. If our weight stays back, or we attempt to strike the ball on the up swing, we will either hit the ground behind the ball, or if we miss the ground we will top the ball. Set up with your weight left, and your shoulders parallel to the ground. 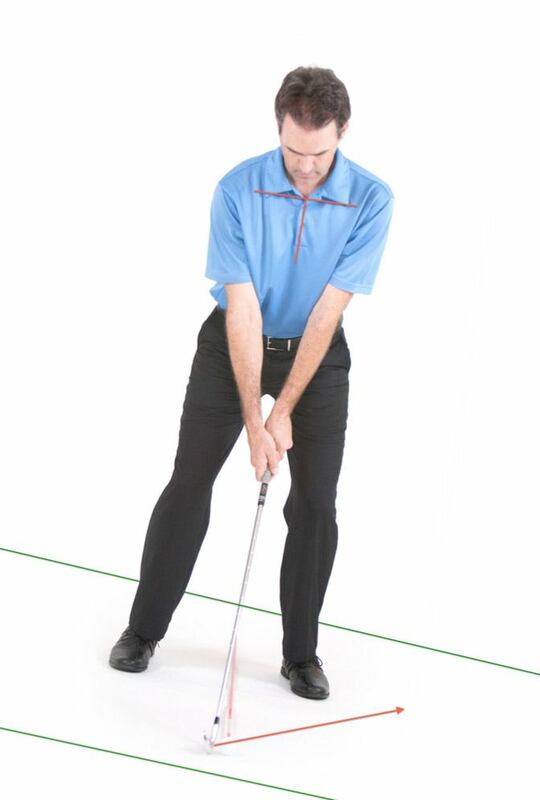 In your backswing, shift to the inside of your right leg, but not too far up the hill. As we make our downswing, we shift targetward starting from the ground up, striking the ball with a descending blow and from the inside. As you shift your weight down the hill, it may not be possible to maintain your balance, and after impact you may step through the shot and fall down the hill. This is okay. I would much rather see you step forward down the hill, than hang back, hitting the shot heavy or thin. 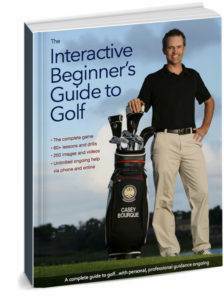 In summary, golf shots from a downhill lie tend to have a lower trajectory and run out when they hit the ground. You’ll need to account for this in your club selection and shot selection. As with all iron shots, contacting the ball and then the turf is imperative to good ball striking. Set up with your body weight leaning down the hill, spine perpendicular to the slope, and your shoulders parallel to the slope. 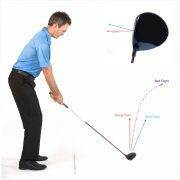 In your golf swing, be sure to shift your weight targetward to your left side through impact. Hanging back on your right side and hitting up on the ball is the worst thing that you can do. I’d rather see you walk through the shot and step down the hill in your follow through.